Hamadoun Touré is an Africanist both in public concerns and personal life. He is deeply committed to improving social conditions in Africa. He's steered many ITU programs to paying special attention to African needs, including the new Conformance and Interoperability initiative. African technologists such as Joshua Peprah of Ghana often are recognized by ITU awards. He’s ahead of most of us; Africa in a few years will have more Internet users than Europe. There are 360M mobiles among Africa’s billion people, expanding at 15%/year. In the next few years most will upgrade and have an net connection. It’s time to start thinking about about a net with more Africans than Americans. Touré presents himself in the dignified suit of the Western businessman but has not been subsumed by Euro-American culture. His friends tell me he’s maintained a fierce pride about his African origins. He became neither Russian while studying in the Soviet union nor French-Swiss after a decade in Geneva. He was born in the desert city, Timbuktu, 1953 in the French colony Mali as a new era approached. His father was a civil servant and he was an only child who grew up in comfort. A new morning breaks in our old Africa. Independence in 1960 did not end the economic struggle. Mali had been in decline, with frequent famines, since the 1500’s. European sailing ships bypassed the trade routes that once made Timbuktu a rich crossroads. In recent years, desertification has expanded the Sahara. The country of Touré’s birth remains one of the poorest on earth. Life expectancy at birth is 53 years; 1 in 10 infants die; literacy is 31%. Graduating at the top of his class, Hamadoun sought a scholarship for graduate work in Canada but that didn’t become available. He was offered opportunities in the Soviet Union and earned advanced degrees in Electrical Engineering in Leningrad and Moscow. Studying in Russia did not turn him into a Communist, contrary to some ugly rumors. Today’s Touré by all accounts is a pragmatist, not an ideologue.. Any young African in 1973 was aware of the U.S. support of the South African apartheid regime, Mobutu in the Congo and the war in Vietnam and at best had mixed feelings for the Western powers. He's built relationships with numerous corporate leaders, including uber-capitalist Carlos Slim and arch-conservative John Chambers of Cisco. He was carefully vetted by the U.S. before his election to head of the ITU, which we did not actively oppose. Like so many, he developed a love for the Russian people and a respect for their technical achievements. He is generous in his praise, standard diplomatic practice. He told Vladimir Putin, "Being a graduate of the Bonch-Bruyevich Institute, I consider myself a resident of St Petersburg and a representative of the Russian Federation at the ITU." In ordinary discourse, comments like that would imply a deep alliance. In diplomacy, that’s just ordinary puffery, meaning little. Angela Merkel or Tony Blair make similar laudatory remarks at meetings. Mutual praise is part of diplomacy. Living in Russia also showed him the down side of the Soviet Union and gave him a healthy skepticism about the government. The horrors of the Stalin era were in living memory when he lived in Russia, and the country was entering the Brezhnev era of stagnation. There was great ferment in the Russian universities, trying to find a way to reconcile the ideals of the Revolution with the practical needs to get things accomplished. Returning home, he worked six years for the Office des Postes et Télécommunications du Mali. He supervised the first earth station in the country in Bamako and managed all international circuits. In 1985, he moved to Washington, D.C. and the private sector, where he worked for INTELSAT (The International Telecommunications Satellite Organization). That year, INTELSAT carried around the world Live Aid Concert to nearly two billion people. The benefit concert for Africa was broadcast from Wembley in London, JFK in Philadelphia and five other sites around the world. Paul McCartney, Sting, Phil Collins, U2, Elton John, Joan Baez, The Beach Boys, Eric Clapton, Mick Jagger, Bob Dylan and dozens more raised over $250M. Over 11 years at Intelsat, he rose to Group Director for Africa and the Middle East, key territories for satellite. Two of his four children were born in the U.S. and are U.S. citizens. He came to love Afro-Cuban jazz and the Fania All-Stars. He then spent two years at ICO Global, an ambitious effort to launch 12 MEO satellites. His can-do attitude made him a strong contender for ITU Secretary-General in 2007, where he was the “African candidate.” His platform emphasized development and security. He led the “European candidate,” Mathias Kurth, by 15 votes on the first round. After Roberto Blois dropped out in the third round, Latin American votes put Hamadoun over the top. As Secretary-General, Touré as promised focused on development. He drove the creation of the Broadband Commission, with private sector participation by Carlos Slim of Telmex, Hans Vestberg of Ericsson, Muhammad Yunus and some unlikely members like Geena Davis and Youssou N'Dour. The Commission closely aligned their program with the U.N. Millenium Development Goals. The BC and the ITU itself have coordinated dozens of different efforts to bring the Internet to everyone. On security, ITU launched the Global Cybersecurity Agenda and has called for an international treaty to prevent Cyberwar. Results here are more limited. The U.S. in particular has felt threatened by international rulemaking and actively opposed the efforts. Touré promised “I will change the perception that people have of ITU, through transparency and accountability.” Touré and the senior staff of the ITU have been very accessible. They travel widely and discuss issues very freely. There’s much more “transparency” although much of the ITU work remains behind a heavy paywall. Most ITU standards committees cost $40,000 or so a year to be involved and see the documents. The latest European Union law requires open access to standards drafts before they are final; the ITU should do that and more to bring in consumer interests. A second promise, “recognition for civil society,” remains at an early stage. The Internet Society is a full sector member, but fewer than 1 in 30 sector members represent the public rather than corporate interests. Provisions for fee waivers for civil society are very slow. Any group wanting to participate in WCIT in December 2012 must be first approved by a council meeting in 2014. That’s difficult. Touré took over an ITU in financial crisis. Five years later, the finances are sound. The operations are far more efficient. Corporations are more active in support. Touré has built relationships with hundreds of national leaders. The majority of nations believe ITU is a well-functioning organization that should take a wider role. 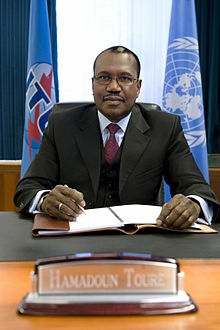 Dr Hamadoun Touré, Secretary-General of the International Telecommunication Union (ITU) since January 2007, was re-elected for a second four-year term in October 2010. As Secretary-General, Dr Touré is committed to ITU’s mission of connecting the world, and to helping achieve the Millennium Development Goals through harnessing the unique potential of Information and Communication Technologies (ICTs). A long-standing champion of ICTs as a driver of social and economic development, Dr Touré previously served as Director of ITU’s Telecommunication Development Bureau (BDT) from 1998-2006. In this role he placed considerable emphasis on implementing the outcomes of the World Summit on the Information Society (WSIS), launching projects based on partnerships with international organizations, governments, the private sector and civil society. Dr Touré started his professional career in his native Mali in 1979. He built a solid career in the satellite industry, serving as managing engineer in Mali’s first International Earth Station. He joined Intelsat’s Assistance and Development Programme in 1985. He was appointed Intelsat’s Group Director for Africa and the Middle East in 1994, earning a reputation as an energetic leader through his commitment to various regional connectivity projects such as RASCOM. In 1996 he joined ICO Global Communications as African Regional General Manager, spearheading the companies’ activities across the African region. A national of Mali, Dr Touré holds a Masters Degree in Electrical Engineering from the Technical Institute of Electronics and Telecommunications of Leningrad, and a PhD from the University of Electronics, Telecommunications and Informatics of Moscow. He is married with four children and two grandchildren, and is proficient in four official ITU languages: English, French, Russian and Spanish.